Improve your hybrid picking skills with this lesson. Usually you hear hybrid picking associated with country guitar or all things Eric Johnson. It's not a particularly aggressive technique, so it's rare in hard rock and metal. Hybrid picking in a Metallica song? Probably not. But Metallica is Metallica — and you're you. People might have said slap guitar isn't metal, but the riff from 1:30 to 2:00 in "The Woven Web" by Animals As Leaders says otherwise. So let's dive into hybrid picking and see if we can get a nice riff from it. Example 1 is a good start. This is a D major spread triad in the root position. Use your pick for the fifth fret, your middle finger for the next string and your ring finger for the highest one. The order should be pick-middle-ring-middle. If hybrid picking is new to you, I'd say start the metronome (which you should be using throughout all of this) at 70 and work your way up. If it's not new, start around 115. Example 1 is really just to get the right hand familiar and has little to do with melody. Example 2 adds the challenge of switching the strings you're plucking and the chord voicing. 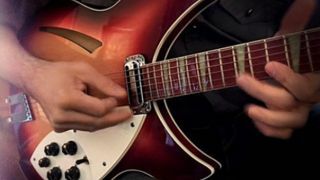 Switching over strings at high speeds can be tricky and sometimes results in the fingers sort of tripping over each other. To me, this is sort of starting to sound musical, the way a piano player might try to make D sound pretty. Throughout this entire lesson, we'll be dealing with spread triads anyway, which sound more piano-like. Example 3 is a harder version of Example 2 in that the plucking hand completely moves from one set of strings to another. Melodically, it adds a larger leap in the top notes of the voicings, which can create a similar effect to tapping a octave above wherever you're playing. The hardest part here will be for the left hand. Switching between two voicings so different quickly and cleanly will really help you get your left hand get familiar with chord shapes as there won't be enough time to think about where your fingers are headed. Example 4 is the big toughie I came up with one night. It almost sounds like tapping because of the spread triads moving high and low so quickly, but it has a distinct hybrid picking vibe. This will definitely get your left hand working hard to get to each chord cleanly and in time, especially going from the high A major chord back down to D major. You're probably going to have to slide back down. This also introduces the first minor chord, F# minor. This idea is more melodic, rhythmic and harmonically interesting than the previous ones, and (to me) sounds like it could be an interesting verse riff. If the technique is new to you, I'd suggest starting this one at 60 bpm or so, as it is rather extreme for both hands. If it's not new, more like 120bpm. Try to get it to 140 and it'll be insane. Also at the end is a fun muted 16th-note triplet leading to a high E natural harmonic. It's tough to keep in time, but the harmonic allows your hand a second to get back to D.
If you have questions, feel free to leave them in the comments section or reach out to me at my YouTube channel here, and I'll get back to you.